When creditors learn that an entity that owes them money has filed for bankruptcy protection, they often fear their claims will remain unpaid or that they will only collect pennies on the dollar. And while that is typically the outcome for unsecured claimants, in certain circumstances creditors may be able to recover a substantial portion of their debt. In fact, as further described below, with effective counsel, a creditor may recover its claim in full. NEW YORK, NY – On March 26, 2015, Michael L. Moskowitz, a founding member of Weltman & Moskowitz, LLP, participated as one of the judges in the Plainview-Old Bethpage John F. Kennedy High School’s 27th Annual Marvin Hazan Moot Court Competition. Mr. Moskowitz participated as a jurist for the eighth consecutive year. The tournament was co-sponsored by the Maurice A. Deane School of Law at Hofstra University. 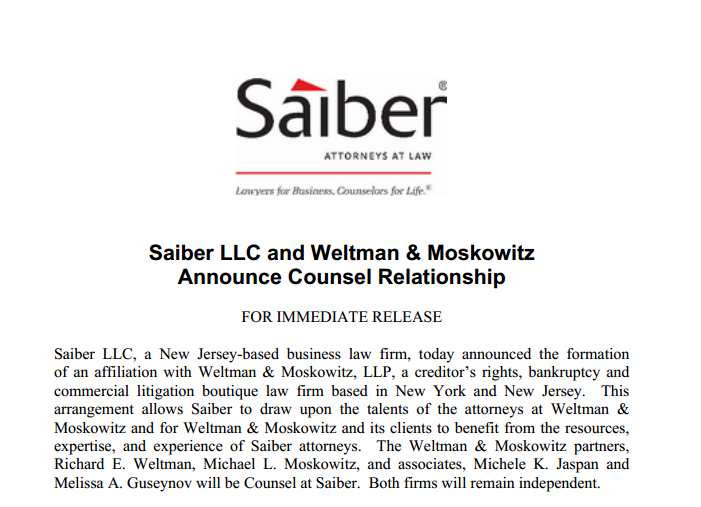 Founding partners Richard E. Weltman & Michael L. Moskowitz are pleased to announce that effective January 1, 2015, the attorneys at Weltman & Moskowitz have become Counsel to the New Jersey-based Saiber law firm. This alliance will allow both firms to develop new relationships and opportunities. Two of our clients, one, a large regional bank, and the other, a personal injury attorney, were both recently sued in adversary proceedings filed in the United States bankruptcy courts. Weltman & Moskowitz successfully established that both complaints were without merit and each plaintiff agreed to withdraw the complaint before answers were required to be filed. In doing so, we saved these clients significant legal fees and expenses and the distractions associated with protracted litigation. 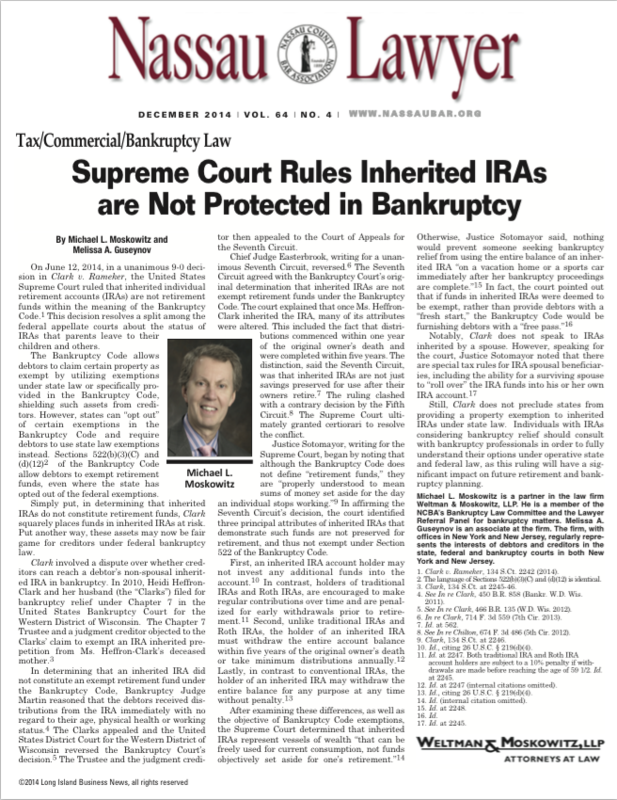 Partner Michael L. Moskowitz and Associate Melissa A. Guseynov co-authored an article published in the December 2014 issue of Nassau Lawyer. They discussed the Supreme Court decision that inherited IRAs are not protected in bankruptcy, a timely topic Weltman and Moskowitz has been following and reporting on regularly. Read an excerpt of the article below. On June 12, 2014, in a unanimous 9-0 decision in Clark v. Rameker, the United States Supreme Court ruled that inherited individual retirement accounts(IRAs) are not retirement funds within the meaning of the Bankruptcy Code.1 This decision resolves a split among the federal appellate courts about the status of IRAs that parents leave to their children and others. A logistics and warehousing company came to Weltman & Moskowitz, LLP, a New York and New Jersey business litigation law firm, because it believed it was wrongfully named as a defendant in a multi-party federal lawsuit commenced in the Southern District of New York by the insurer subrogee of the consignor. 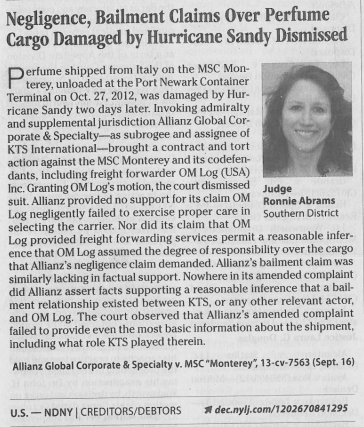 Insurer alleged that our client had acted as a freight forwarder and bailee with respect to certain cargo damaged by Superstorm Sandy in October 2012. 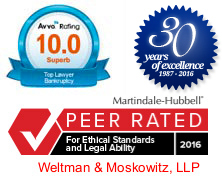 Weltman & Moskowitz, LLP is proud to announce the selection of its founding partners, Richard E. Weltman and Michael L. Moskowitz, as Super Lawyers for 2014. This honor is a product of a rigorous investigative process by the publishers of Law and Politics. Attorneys are selected based on professional accomplishments, licenses and certificates, peer recognition and personal achievements. 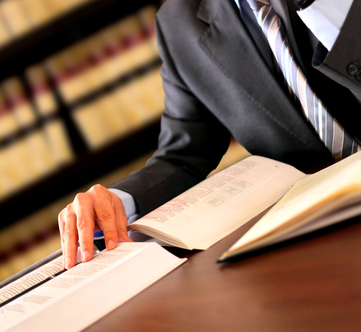 The final published list represents no more than 5% of the lawyers in each state. 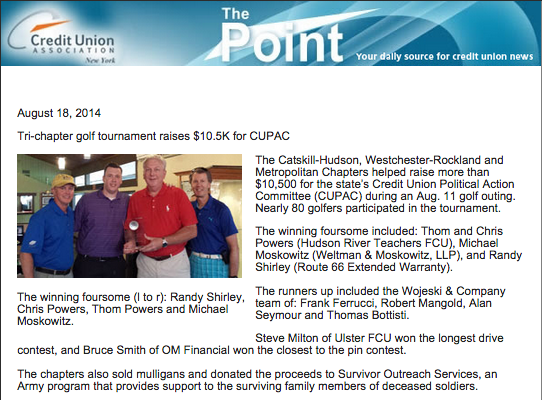 On August 11, Michael Moskowitz was part of the winning foursome at a golf outing that helped raise more than $10,500 for the state’s Credit Union Political Action Committee (CUPAC). The Catskill-Hudson, Westchester-Rockland and Metropolitan Chapters held the event. Nearly 80 golfers participated in the tournament. We recently reported on whether a bankruptcy debtor’s rent-stabilized lease constitutes an exempt asset in the form of a “local public assistance benefit” under New York Debtor and Creditor Law. The case is presently under consideration before the New York Court of Appeals. Weltman & Moskowitz began following the case in October, when we reported on the chapter 7 trustee’s efforts to sell the rent-stabilized lease of Mary Veronica Santiago-Monteverde (“Debtor”), a 79-year-old widow. 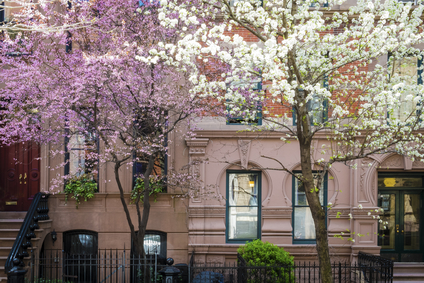 Many readers have been following the debtor’s opposition to the chapter 7 trustee’s efforts to sell the debtor’s interest in her rent-stabilized lease to the landlord as an asset of the bankruptcy estate. The United States Judicial Conference recently approved changes to the federal court miscellaneous fee schedules, including certain bankruptcy filing fees. 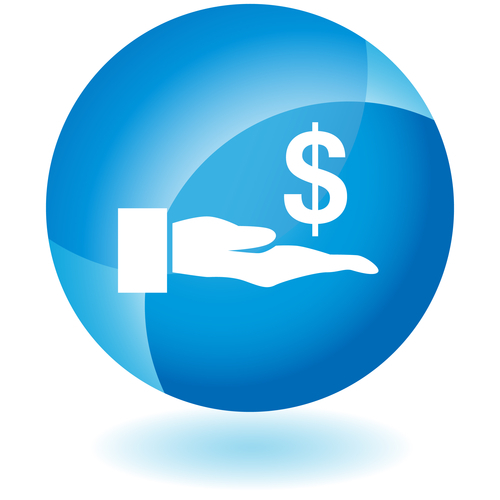 As of Sunday, June 1, 2014, the filing fees for most bankruptcy matters will rise. These fees are collected from both debtors and creditors accessing the federal bankruptcy courts, whether in person or online. MICHAEL MOSKOWITZ PARTICIPATES IN THE PLAINVIEW-OLD BETHPAGE JFK HIGH SCHOOL’S 26th ANNUAL MOOT COURT COMPETITION, HELD ON APRIL 3, 2014. NEW YORK, NY – On April 3, 2014, Michael L. Moskowitz, a founding member of Weltman & Moskowitz, LLP, participated as one of the judges in the Plainview-Old Bethpage John F. Kennedy High School’s 26th Annual Marvin Hazan Moot Court Competition. Attached is a wonderful reference guide published by the City Bar Justice Center titled Understanding Reaffirmation Agreements. A reaffirmation agreement is a contract between a debtor and creditor wherein the debtor agrees the creditor’s debt will survive the bankruptcy discharge. The authority for entry into a reaffirmation agreement can be found in 11 U.S.C. §524(c). Debtors and creditors alike are typically barraged with misinformation regarding when reaffirmation agreements are appropriate. Michael Moskowitz will be a featured speaker at the New York State Bar Association’s Annual Meeting on January 29, 2014. Mr. Moskowitz’s panel, one of three to be presented by the Young Lawyers Section, will focus on consumer and corporate bankruptcy issues. insert excerpt info here. Having represented numerous defendants in Ponzi-scheme adversary proceedings in the Second Circuit (New York), Weltman & Moskowitz closely follows the case law arising out of the massive Ponzi-scheme run by the now infamous Bernie Madoff. Uncovered in 2008, the resulting Madoff bankruptcies spawned dozens of decisions by the Bankruptcy Court, District Court and Second Circuit. Weltman & Moskowitz, LLP is pleased to announced it has signed a lease renewal for its New York CIty headquarters located at 270 Madison Avenue. The lease runs through December 31, 2022. The law firm of Weltman & Moskowitz, LLP is delighted to announce the launch of its newly redesigned website, www.weltmosk.com. NEW YORK, NY - On April 14, 2012, Michael L. Moskowitz, a founding member of Weltman & Moskowitz, LLP, participated, for the eleventh consecutive year, as one of three "appellate judges" sitting at the Maurice A. Deane School of Law at Hofstra University with oral arguments made by first-year law students. NEW YORK, NY - On March 29, 2012, Michael L. Moskowitz, a founding member of Weltman & Moskowitz, LLP, participated as one of the judges in the Plainview-Old Bethpage John F. Kennedy High School's 23rd Annual Moot Court Competition. The tournament was co-sponsored by the Maurice A. Deane School of Law at Hofstra University. Weltman & Moskowitz, LLP is pleased to announce that Melissa A. Guseynov has joined the firm as an associate in the Bankruptcy and Creditors’ Rights Group. MICHAEL MOSKOWITZ PARTICIPATES AS AN "APPELLATE JUDGE" FOR FIRST-YEAR HOFSTRA LAW SCHOOL STUDENTS ON APRIL 9, 2011. NEW YORK, NY - On April 9, 2011, Michael L. Moskowitz, a founding member of Weltman & Moskowitz, LLP, participated, for the eleventh consecutive year, as one of three "appellate judges" sitting at Hofstra University School of Law in connection with oral arguments made by first-year law students. MICHAEL MOSKOWITZ PARTICIPATES IN THE PLAINVIEW-OLD BETHPAGE JFK HIGH SCHOOL'S 23rd ANNUAL MOOT COURT COMPETITION, HELD ON April 7, 2011. NEW YORK, NY - On April 7, 2011, Michael L. Moskowitz, a founding member of Weltman & Moskowitz, LLP, participated as one of the judges in the Plainview-Old Bethpage John F. Kennedy High School's 23rd Annual Moot Court Competition. The tournament was co-sponsored by the Hofstra University School of Law. Richard E. Weltman, a founding partner in the law firm of Weltman & Moskowitz, LLP, was recently elected to the Board of Directors of the Executives' Association of Greater New York (EANYC) for a three-year term. Mr. Weltman has been a member of EANYC since 2004. NEW YORK, NY - On April 3, 2008, Michael L. Moskowitz, a founding member of Weltman & Moskowitz, LLP, participated as one of the judges in the Plainview-Old Bethpage John F. Kennedy High School's 20th Annual Moot Court Competition. The tournament was co-sponsored by the Hofstra University School of Law. MICHAEL MOSKOWITZ PARTICIPATED IN THE PLAINVIEW-OLD BETHPAGE JFK HIGH SCHOOL'S 19th ANNUAL MOOT COURT COMPETITION, HELD ON MARCH 29, 2007. NEW YORK, NY - On March 29, 2007, Michael L. Moskowitz, a founding member of Weltman & Moskowitz, LLP, participated as one of the judges in the Plainview-Old Bethpage John F. Kennedy High School's 19th Annual Moot Court Competition. The tournament was co-sponsored by the Hofstra University School of Law. NEW YORK, NY - Michael L. Moskowitz, a founding partner in the law firm of Weltman & Moskowitz, LLP, was recently elected to the Board of Directors of the Executives' Association of Greater New York (EANYC) for a three-year term. Mr. Moskowitz has been a member of the Executives' Association since 2004. NEW YORK, NY - Richard E. Weltman, a renowned New York and New Jersey bankruptcy and business lawyer, and a founding member of the law firm of Weltman & Moskowitz, LLP, was honored on May 3, 2006 by Legal Services of New Jersey and the New Jersey State Bar Association at the 20th Annual Legal Services Awards Reception for his tireless efforts on behalf of indigent consumers in need of bankruptcy assistance. NEW YORK, NY - Richard E. Weltman, a renowned New York and New Jersey bankruptcy and business lawyer, and a founding member of the law firm of Weltman & Moskowitz, LLP, was recently honored by Northeast New Jersey Legal Services at its annual awards reception for his tireless efforts on behalf of indigent consumers in need of bankruptcy assistance.